The Regency period saw a shift away from the glamourous, intricate designs of the past, into a simpler, more austere style. The fireplaces in this range are much sleeker than the Georgian or French designs and feature smooth lines and gentle curves. If you want something clean and classic, this is an ideal style to adopt for your home. Regency fireplaces and fire surrounds are often lower than many other styles, as well as having an abundance of clean, straight lines, rather than the detailed cornices of other period fire surrounds. Our range features very simple styles like the Thomas Hope, which looks stunning with a two-toned grate. Alternatively, if you want something with a bit of detail, the Acanthus design has those extra little touches that make it stand out from the competition. Marble and limestone are popular materials, but Regency fire surrounds are also available in natural wood if you want something a bit different. We offer a bespoke design service, so if you can’t find exactly what you’re looking for within this range, then get in touch and see what we can create for you. Our showrooms in London and Hampshire have a large collection of Regency fireplaces available to view, but you’ll also find our bespoke design team on hand to meet your exact requirements if you need them. 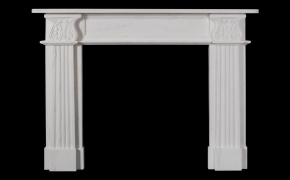 The Acanthus marble fireplace is a faithful rendering of a Regency design. 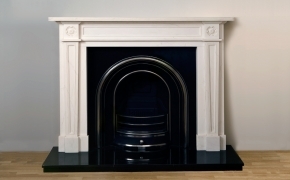 The Acanthus limestone fireplace is a faithful rendering of a Regency design.